It's pre-exam times and the perfect opportunity to find lame excuses not to study. Today: building circuits! This time I decided to go the most basic way of doing things. With a focus on trying to build something that's robust, safe to use, doesn't require any fancy integrated circuits and still provides the most necessary functionality. Sry bout the non-embedded images, I still need to find a better replacement for my old webhosting service than google. So far I got Inductive charging done, with the circuit ready to transfer data,too. In that picture the Implant is receiving about 25mW of power across about 1cm of airgap. The transmitter's power is limited to about 150mW maximum in this setup. That's 150mW to cover all losses which includes the losses of the transmitter coil and capacitors, the power the implant draws (including all it's internal losses), eddy currents from metallic objects/shielding nearby etc. So no matter what happens, short circuits, metal objects etc, the transmitter should never be able to cause serious damage. Still it's enough to light up an LED and to charge the NiMH coin cell there. Max usable range was about 30mm and maximum usable output power (for 10mm) was about 50mW. Most of the components used are available as rather small SMD packages so even if it looks like a lot of parts, it's not going to take up a lot of space. The circuit includes power transfer, rectifier, voltage doubler, battery charging, indicator led and a shunting mosfet to do loadmodulation (communication) but it can also be used to blink the LED if the charger is present. The battery in the picture is a 40mAh NiMH type which can be safely trickle charged for indefinite time periods. 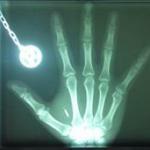 The aluminum bar in the pic was used to simulate the effects of the implant's metal shielding on the system. Turns out it consumes a bit of power but mostly shifts the resonating frequency. Compensating for this effect is reasonably easy and the power transfer continues to work. Even covering most of the coil with a thick aluminum plate will not entirely stop it from working. Adjusting the frequency and increasing the power output by a bit makes it work again. I have not done any tests regarding data transfer speed but the simulation suggests that you would want to keep it somewhere below 1200 bit/s. So none of your favorite tv-show episodes on your implant, but plenty for debugging and setting parameters, and maybe a bit of poetry. The circuit so far requires a total volume of about 11x13x30mm (or about 2/3 of a AA battery) when the parts would be assembled in a compact way (and that's with no SMD parts). Coil and battery take the biggest share. With a custom wound coil you can trim down the 11mm to 7mm. The circuit can be build almost entirely from parts that are robust vs performance degradation over time. Except for the battery. Next on my list is the actual power management. Means converting the low battery voltage to something more usable for microcontrollers and op-amps to work with and stuff like standby modes etc. After that it's wiring up the microcontroller and setting up the communication for data exchange. Followed by an electrode driver to allow the implant to send feedback to the body. @ThomasEgi This sounds really fascinating! I can't wait to see what comes of your project. @trybalwolf in summary, super caps store very little energy compared to batteries. Joule thief would help you getting all the energy out of a cap, but in case of a rechargeable battery that's not desired as you would damage the battery. Joule thief typically suffer from poor efficiency too. You certainly want a proper step-up converter whenever possible. The circuit itself pretty much is a "wireless charging power solution", similar to what you'd find in mobile phones, but with more focus on safety than high power output. You can easily run a microcontroller and other stuff on this. It's enough to read/write pages of an sd-card. At lower speeds ofc, but certainly possible. Just for fun, i put it all together after tweaking frequencies a bit. Now has slightly more range and fits into a compact 12x15x27mm (pretty much as expected). Tried to see how small things can go. This time I went a bit easy on the specs and my sole goal was to light up an LED enough to be fairly visible (which requires about 1.9V and 1 to 3mA. Not stellar, but enough to slowly charge a battery or directly power some smallish circuit. Even the smallest inductor i had around (2.5x2.5x1.6mm) was able to light up the LED with more than 16mm spacing between the coils. Main observation was that bigger coils have less strict requirements on tuning the LC circuit to the right frequency. However, if you do properly adjust and tune (which can be automated on the transmitter side), you can transmit power even with pretty small off the shelf coils. For practical reasons 7mm diameter and up seems to be doing okay. Long story somewhat short: The power needs to be transmitted using the part of the magnetic field from the transmitter coil that actually flows through your receiver coil. The ratio between the entire field and the part that flows through both coils boils down to the k-factor. Given the operating frequency you can calculate the required field strength at your receiver coil, and with the k factor you can calculate the field your transmitter coil has to build up. With that number, you have to build a suited coil to deliver the required fields. As the k-factor typically is rather low, means most of the energy you put into the field does not get to the receiver you want to utilize the unused energy stored in the field in the next cycle. That's what the capacitor is for. Long story short, the worse your coupling, the better your energy recycling needs to be in order to get an efficient energy transfer. You can brute force the current through the coil but that's pretty dangerous as the energy you put into it is enough to heat metals red-hot. In order to get good energy recycling you want to minimize losses at the transmitter side, which means a coil with good quality factor, as short wires as reasonable, and capacitors which have low loss at the rated current/voltage/frequency. The whole thing can get confusing rather quickly and depending on your theoretical background there might be other, less confusing explanations around. Oo thanks for the video. I'm not great with theoretical microelectronics, but i am great at math, so given a ressonable explanation I think i can figure it out. (I don't know what a lot of the notes in your circuit diagram mean...) A lot of bare coils on mouser didn't seem to indicate if they were tx or rx coils, and I know you just can't take 2 arbitrary coils and make it work well. So getting the right coils seems hard. This will basically give you all possible combinations of required current/field/inductance. You can build up the required field with a low current and an inductor with a high value, but the higher the inductance, the more time is required to reach the desired current, limiting your maximum frequency. Most inductors you buy are made to contain the magnetic field in a small space to not cause electromagnetic interference with other components. Those parts won't really work well as transmitter coil, but many can still be used for receiver coils (altho they might not be the best possible option). As for the transmitter coil, you want to either build one yourself, or buy one that's specially designed for high q-factor and extending fields. As materials you'd want reasonably thick wire, preferably silver plated. Another good option is to use special wires of individually insulated thin strands. Building the perfect coil for an application can be a bit of an art, but you can get working results with just limited effort and investment. Thomas you are making surprising progress. Most users who research this topic give up after seeing how difficult the math is, how little electricity can make it to the receiver coil since it drops of rapidly, and the amount of heat generated. May I ask how you are counteracting the amount of heat that is generated? The only plausible thing I can think of is a theoretical "trickle transmission." Trickle transmission is increasing the amount of transmitters, decreasing voltage, and decreasing distance between receiving and transmitting coils as much as possible to negate the drop off from the magnetic field. This complicates the setup but is considerably more safe in regards to heat and voltage. The main drawback from this method is the low voltage makes charging batteries through materials such as cloth less efficient. Can you post more information/pictures about your transmitter? @ThermalWinter The transmitter really just is the coil, capacitors and square wave generator (preferably with low resistance drivers). About the heat thing. The trick is... not generating heat in first place. Sounds dump, I know, but lemme explain. What you really want is a strong magnetic field emitted from your transmitter coil. Means you want as much current going through your coil as possible. But you only need the current, it does not mean you need power. So you try to get a big current going without using a lot of power. Most of the energy contained in that magnetic field is never used, so you don't need to re-supply it. You can harvest this energy as you let the field collapse. That's what C2 in the circuit diagram is for. It recycles the unused energy of the magnetic field to charge up the capacitor, just to pump it back into the field energy the next cycle. So the entire energy is contained in the LC combination, and does not need to be supplied, which means you never lost it as heat. Well, ideally that is. Of course you have a few losses in the coil, wires, caps, driving electronics etc. Keeping those small is key. The amount of power you can deliver depends on your choice of caps and drive voltage. If you look at the circuit diagram, C2 is used to keep up the resonance going without loading high currents through your driver circuitry. C1 is only a fraction of the value of C2 ,thus takes only a small share of the current of the oscillation (in this case 5%, which avoid loading the drive circuit with high currents). But even if C1 is small it still allows to add the desired energy to the system. As the energy you add each half wave is basically equal to 0.5*C*V². So if you want more power, you increase the driving voltage, or the size of the C1 capacitor. If you need more range, you improve the quality of the transmitter resonator (that's mainly improving the coil). If your transmitter driver gets too hot, you'r probably doing something wrong... you really should either build a proper driver or change your C1/C2 ratio or improve the quality of your LC circuit. Even if you manage to build crazy good coils and near-perfect driver circuitry, the transmitter still won't harm your device. Because what's happening when you put a receiver coil near that receives power is: you take energy out of that LC-current-magnetic-field recycling. So the energy in the transmitter LC is reduced, causing less current to be available in the coil, leading to less powerful magnetic fields, leading to less transmitted power. This mechanism is also used for communicating from receiver to transmitter. You increase the load, removing energy from the transmitter , and the voltages/currents of the transmitter drop. So there's no real need for multiple transmitters, voltage reduction and trickle things. Decreasing distance sure helps with the coupling allowing you to get away with worse coils, but the design goal is the opposite. Never put too much energy in, never have too much energy end up in the wrong place. Reaching high voltages on the receiver end is a matter of the quality factor of the receiver coil. If not connected to LED's those little things can easily reach 50 Vpp and more even when 3 cm away. But again, as soon as you connect a load which removes the energy from the resonator , smooth sailing and no harm done. You can, of course, force as much current into your coil as possible, and supply as much energy to it as you can. That's the point where you are turning your nice wireless charging circuit into an induction stove. But then, change the C1/C2 ratio, limit your C1 driving voltage, and you'r good to go.